I usually break hikes into segments up in my head. Dana has three. The part where you go up, the part where you go up a whole lot more, and the part where you hike down. Even though the summit of Mt. Dana is just over three miles from the trailhead - the hike takes up the better part of the afternoon as it’s quite steep. 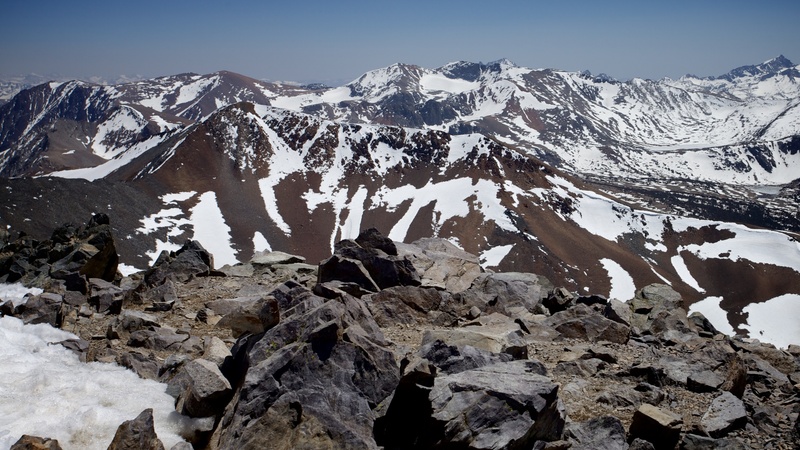 The summit views are some of the tops in the Sierra making Dana a very popular climb. The trailhead for Mt. 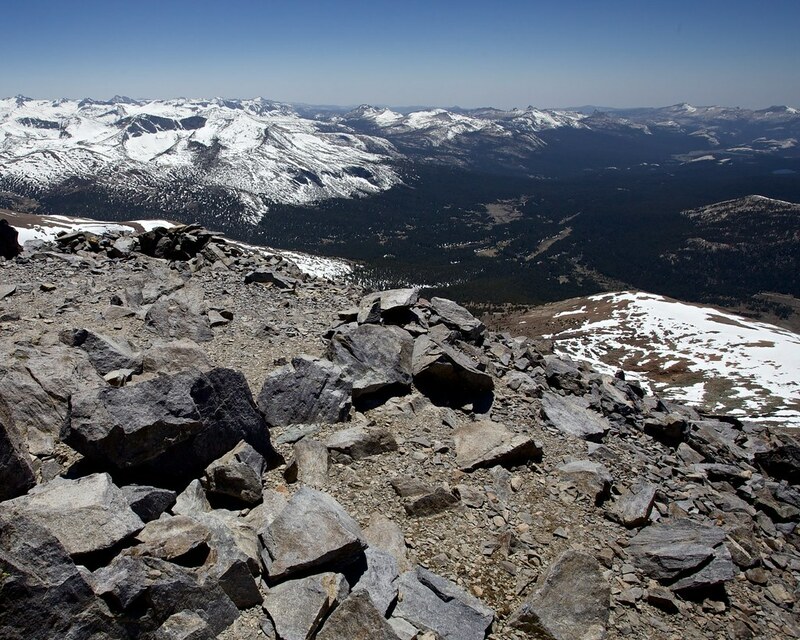 Dana is located right near the Tioga Pass entrance to Yosemite National Park. It’s not super well marked, so it took my friend Greg and I a couple minutes to find. 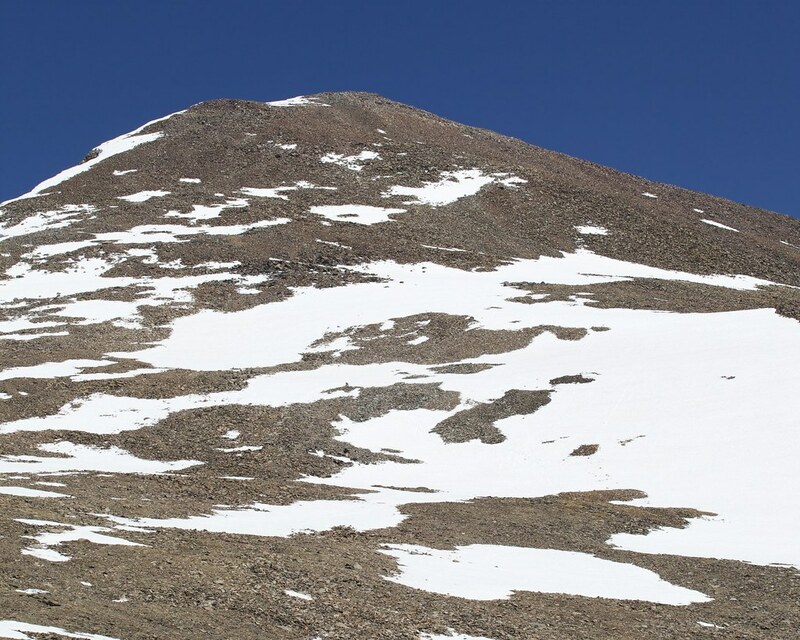 The trailhead is already at 9,945 feet elevation, and we had not acclimatized. So from the outset I found myself sucking wind. Frequent patches of melting snow littered the trail for the first half mile which winds through the trees on the outskirts of Dana Meadow on it’s way to the base of Mt. Dana. We took frequent breaks to catch our breath and chug water once the real climbing began. The trail actually started to clear up the higher we got (that script would flip eventually) as the trees became scarce. We soon found ourselves above the trees as the dirt trail started to give way to rocks and eventually scree. Mt. Gibbs from above the tree-line. A little under an hour into the hike the trail eases off it’s steep climb around 11,200 feet with a steep climb looming ahead. Large patches of snow covered most of the slope ahead - obscuring the trail. We spotted a couple of cairns, several hundred feet apart, but decided the trail was not well enough marked to bother trying to follow it. 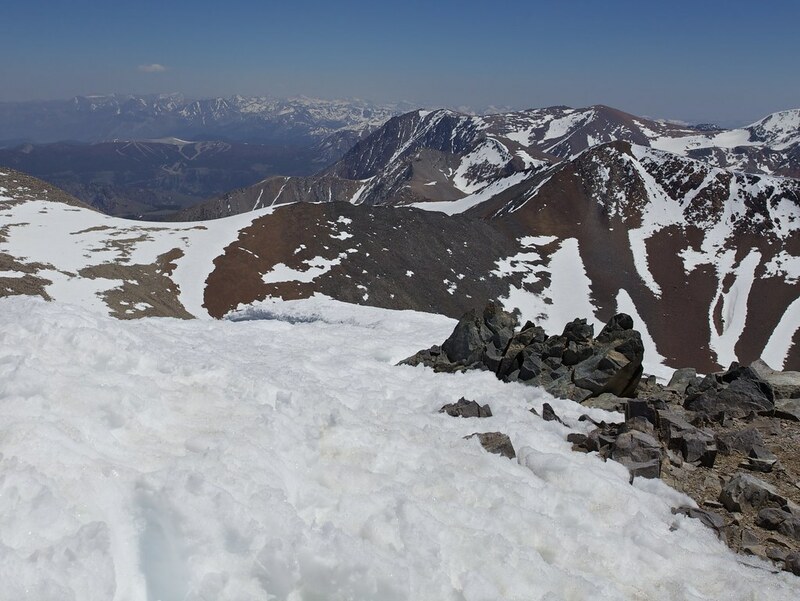 We followed a set of boot prints instead that marched right up the largest snowfield in the middle of the slope. The going was slow. Elevation and snow ground our ascent to a crawl. My eyes were mostly focused on the 3-4 feet of snow directly in front of my boots as I counted off my steps until my next pause to catch my breath. When I did finally turn around views of the surrounding country opened up. 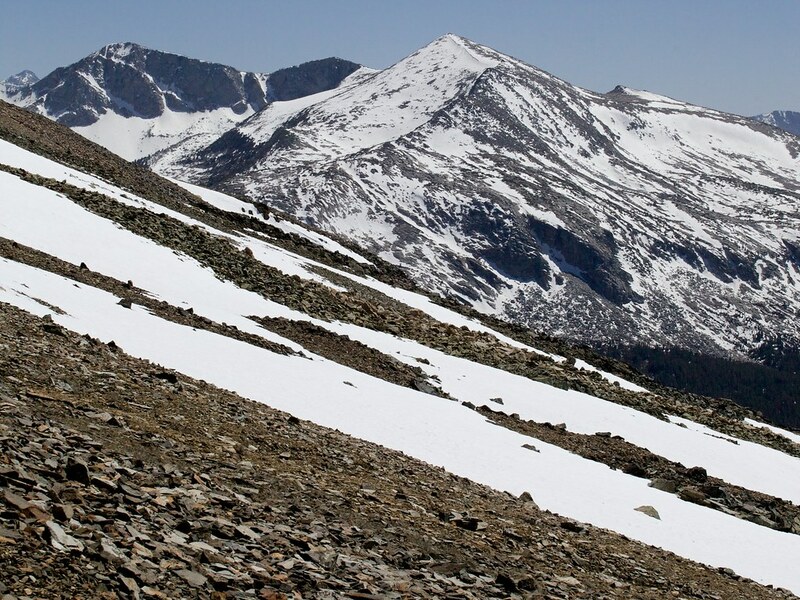 Near the top of the ridge, the snow gave way to scree and we hustled to the top where another larger, steeper slope loomed above us. This time though--the summit would be waiting at the top. We debated for a few minutes the best path through the snow to the top - eventually settling on a path right up the middle again. My hands were getting a little puffy and I picked up a light headache - two surefire signs of oncoming acute mountain sickness. We were close enough to our goal though it didn’t concern me much. What did concern me was a small bank of puffy white clouds building over the Dana Plateau - a possible sign of afternoon thunderstorms about to arrive. Looking up to the summit of Mt. Dana (13,053 feet). Greg climbing the final hundred feet to the top. We picked up our pace near the top once the snow broke and we found the trail again. I nervously watched the clouds building as we scrambled over boulders, just a few hundred feet from the top. Greg yelped out with excitement just ahead of me while I focused on another group of white puffy clouds fixed just to the east of the summit. A minute later I caught up to Greg - the climbing stopped. We had hit the summit. 13,053 feet. 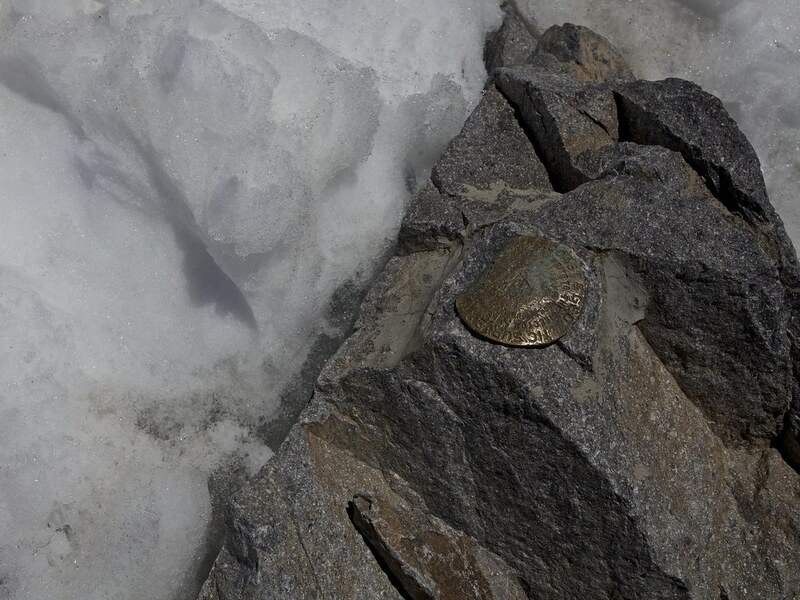 It was mostly covered with snow, but the summit marker had been exposed. I looked at my watch. Five past One. Thunderstorms could start any time. We paused for just a couple minutes at the top. Countless granite peaks covered with gleaming white snow rolled as far as the eye could see to both the north and the south. The massive turquoise eye of Mono Lake dominated views to the east. Evergreen forests swept out to west, broken up by the spires of the Cathedral Range and patches of yellow-green meadows, not yet at their summer peak and still recovering from the freeze of winter. Looking west towards the Cathedral Range and Tuolumne Meadows. 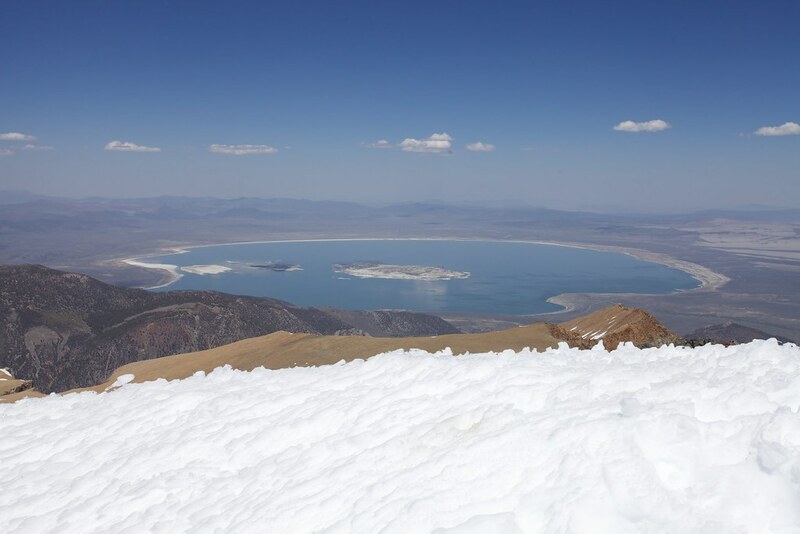 Mono Lake beyond snow capped summit. On the way down we made incredible time. 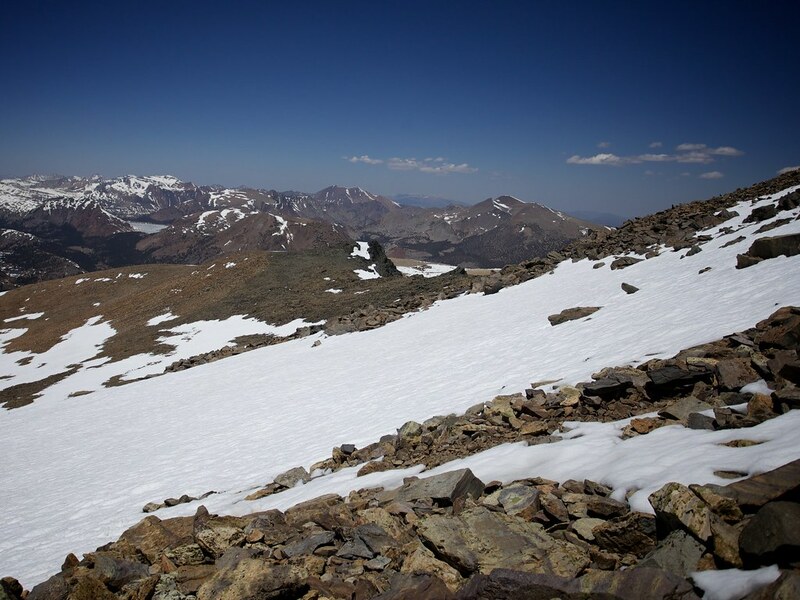 Especially down the snowfields where the snow was deep enough we could heel-plunge and keep a pace only slightly slower than an outright run. The summit slope - which it took us two hours to climb - we jogged down in just twenty minutes. 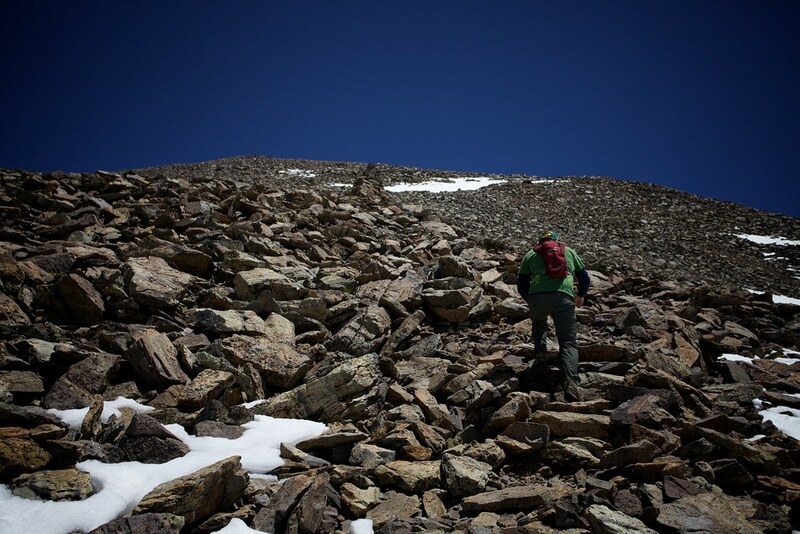 Eventually the snow gave way to scree, and then dirt. Soon we were back in the trees - and before we knew it, back at the car. Hike complete.